When our dog Gunnar was just a little chap, my friend Linda also had a little chap of her own. He came to them at the age of 1, the day after his first birthday, from a family who couldn't keep him because one of their children was seriously allergic to dogs. On their way home from Chicago, where they adopted him, they stopped by to visit us and introduced us to Boomer. 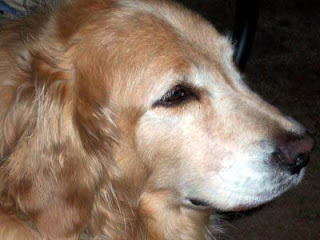 We had lost our dear first golden AJ (against whom all others will forever be measured) earlier that year -- and even though we had two more golden girls and a very rambunctious Gunnar (who was a puppy until he was seven years old at least) -- Boomer instantly won a place in our hearts because he was so much an AJ sort of dog. He absolutely wriggled with happiness at the joy of being our friend and visiting in our house. And he made the AJ noise for me which is sort of a moan of happiness or pure bliss or something like. He did it for me (Linda says he never did it for anyone else) so Boomer and I definitely bonded. He bonded with Gunnar, too. Linda brought him to visit every time she came for a year or two (she lives about 75 miles away so we don't see each other all that often). But Gunnar never forgot Boomer and Boomer never forgot Gunnar. They absolutely flung themselves on each other the instant they saw each other and they wrestled and they romped and they threw each other around and mostly they slobbered and spit on each other so much they were (sorry, but it's the truth) like two giant spitwads instead of dogs. They were the definition of puppy exuberance. No one ever played the way those two played. And even though they got older and each got siblings they learned to play with, I don't think anyone ever replaced Boomer in Gunnar's estimation as the best playmate in the world (well, Jake did, I guess, but that's because Jake let Gunnar win even when he could have clopped him one). I spent the night at Linda's before catching the plane to come to the granddaughter's. When I got there, Boomer flung himself at me the minute I walked in the door. He wriggled and wiggled and beamed and bumped me with his head. And he made his noise. A lot of "I'm sooooo glad to see you. You are my Very Best Friend," noise. He even spent a good part of the night on the floor of my room and he was right there to see me off in the dark of morning when I left. I expected to see him when I got home tomorrow. But Linda called today to say that Boomer has crossed the rainbow bridge, completely unexpectedly. He had a tumor no one knew about on his spleen. That is exactly what caused AJ's death, but in this case it caused Boomer's spleen to burst, and by the time they knew what had happened, he was nearly gone. Letting him go then was the only merciful thing they could do. But it makes me cry even now just thinking about it. The blessing of dogs like Boomer in our lives is so profound, yet sometimes it seems so fleeting because it hurts so much to lose them. Boomer died 10 years to the day that he came home to Linda's house. He had a wonderful life. He was loved and adored by all who knew him. Everyone at our house will miss him. And we will always remember him for the joy he brought into all our lives. Fare thee well, Boomer. We love you and we'll miss you. Thank you for being you. He sounds an utterly gorgeous dog. Sending hugs, Anne. And hoping you get swiftly to the point where you remember the good times without crying. d-o-g. So I know his loss will hit those who loved him hard - and he sounds SO loveable. Thank you all for your kind words. I will pass them on to Linda who will doubtless read them herself. Boomer was simply one of the VERY BEST. We were privileged to have him in our lives. Kate, take care of Bob. We've had enough of this sort of thing this week. He can just hang on and get some quality of life in doing so! Sending many hugs and muchsympathy. It is never easy to lose a pet. And friends of your pet. Boomer sounds like a wonderful dog. Hi, I'm Boomer's mom. I just read Anne's wonderful tribute to my wonderful boy. And I do so remember those "spitwad" days. Makes me wish I'd driven him up to see his pal more often. But then don't we always wish so many things when a precious part of our lives leaves us? As he passed, I kissed him and hugged him and told him to go find Truffles, our basset hound and his other dear pal who died three years ago. I know they're together again, and that they have indeed found AJ, a brother of the heart in the truest sense, because they both had such enormous ones. Thank you all for your kind thoughts.